Do you want to enjoy fries but worried about health? You can create a much healthier version of all your favorite dishes like French fries, chicken meatballs, crispy poppers etc. with the air fryer. This is one of the most essential cooking appliances which you must add to your kitchen equipment. With the growing consciousness about fitness and healthier life, you must cut off excess oil from your diet. You do not have to limit yourself from the fried foods just to remain healthy. You can make fries healthier too. What can be a better way to do so without an electric air fryer? 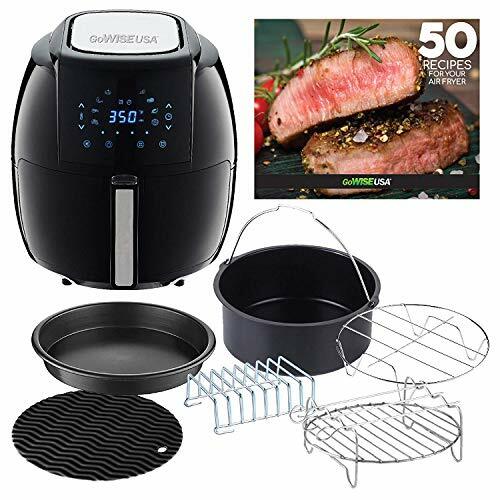 If you are looking for one of the best and most efficient electric fryer, then GoWide USA 8-in-1 Electric fryer is the best. This electric fryer can cook fries and crispy delicious foods for you with the help air. The technology that it uses to cook such foods is quite advanced. With the help of rapid air circulation technology, the fryer can cook foods with no or little oil. It makes cooking much healthier and it also provides you with a hassle-free experience. With such an innovative technology, one can easily cook pork, shrimp, pizzas, fries, steaks, chicken and even cakes in this. The GoWise electric air fryer comes with some amazing features and versatile specifications. Read on to know more about these. 8 Presets: This product is an amazing innovation by GoWISE. It comes with 8 presets which help you in an effortless cooking experience. You can cook various recipes with the help of this appliance. Digital touch screen: Another great aspect of this cooking appliance is its sleek and modern design. It looks and feel quite premium in nature. The digital touch screen provides easy access to the controls and makes it easy to operate. PFOA-free: Unlike other air fryers, this one comes with the FDA certified non-stick pan which is completely PFOA-free. Thus, you can be assured that no nasty chemicals or toxins are used in this product.Easy to serve: The most amazing part is the safe detachment. Each and every basket can be detached safely with a button guard. So, it becomes easier to serve without causing an accidental detachment.Start/stop Button: This air fryer comes with a new start and stop button which certainly makes it a lot easier for you to change the settings in the middle of a cooking cycle.5.8 QT capacity: This electric cooking appliance is perfect a large family consisting of 4 or more family members. It comes with a capacity of 5.8 QT which is quite enough for cooking a large quantity of food. Hassle-Free cooking experience. Whenever you are cooking something, you always wish to have a completely hassle-free cooking experience so that you can enjoy the process. This cooking appliance comes with 8 preset cooking types that help you to cook varieties of dishes without any hassle. Whether you want to enjoy pizzas or some French fries or some crispy bacon or chicken, this can provide you with many such dishes instantly without much effort at all. Healthy cooking. No doubt, people always want to have something unhealthy now or then. Whether it is fries or having cake or pizza or fried meat, everyone wants to have these. But in normal cooking style, you have to use a lot of oil to cook these foods. That is not at all healthy. If you are a health and fitness conscious person, then you may think that having these foods are not possible. But that is not true at all. With the help of this air frying appliance, you can fry or cook foods with very little or no oil at all. Hence, you can enjoy tasty fried foods with no oil making it super healthy for you. Cook different dishes. Do you want to cook some healthy dishes for your breakfast, lunch, and dinner? Then you must buy this air fryer. With the help of this cooking appliance, you can cook various dishes. You can try about 50 amazing recipes with this cooking appliance. Thus, you do not have to be worried about what to cook at dinner, lunch or even at breakfast. You can enjoy great foods with high nutritional values. Available in different colors. Besides being versatile in functions, it looks quite modern and sleek. It can definitely increase the aesthetic factor of your kitchen. It is also available in 4 different colors in the market. So, you can choose one depending on the interior design and décor of your kitchen. Easy to clean. You do not have to worry about cleaning this air fryer. It doesn’t need a lot of maintenance or effort to clean. Since oil is not used much in the cooking, there is no greasiness. Hence, cleaning it up is always a breeze. Simply use one of the best non-abrasive sponge with clean this fryer with warm water after cooking. It is simple and can clean it completely. Can prepare various types of recipes. So, if you are looking for a great air fryer which can help you in cooking oil free, this is the one you must choose. The GoWISE electric 8-in-1 fryer can efficiently cook various types of food in the healthiest way possible. You will be able to enjoy some amazing dishes without feeling guilty of it. Also, the versatile features make it highly reliable and very easy to use and control. Thus, you can have a complete hassle-free experience while cooking your food with this fryer. Make sure to grab this one to enjoy some delicious fries in the healthiest way!